Ex-boyfriends â€“ we all have them.Â Some you may want to hide from, while others may be worth keeping around.Â As long as one of you didnâ€™t screw up big time in the relationship, breaking up doesnâ€™t have to mean never seeing each other again.Â Many people tell horror stories about how disastrous it was trying to be friends with their ex-boyfriend, but thatâ€™s probably because they werenâ€™t following the rules. While being friends with an ex can work, it certainly doesnâ€™t mean the same thing as being friends with just anyone. Â The fact that the two of you have been intimate changes the dynamics of the friendship. This rarely means that the two of you can spend all day together, multiple times a week, trading stories and sharing a beer. You will probably never be quite as buddy-buddy as that. But this friendship can mean that you are on good terms, post a â€œHappy Birthdayâ€ message on each otherâ€™s Facebook wall, and even hang out occasionally. Hereâ€™s how itâ€™s done. The most important rule of thumb after a break up is to take some time apart. Donâ€™t call him, donâ€™t text him â€“ donâ€™t have any form of contact with your ex-boyfriend for a few months. Just because you are broken up does not mean that the romantic charge of the relationship has vanished. This will give time to not only get over him, but evaluate whether or not he is worth having a friendship with. Generally this process takes a couple of months. A good rule to go by is if you get extremely jealous or sad at the thought of your ex-boyfriend having a new woman is his life, you are not ready to be friends. 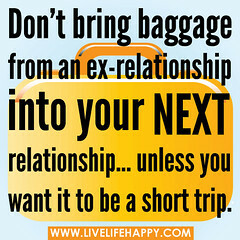 Donâ€™t consider having a friendship with an ex who has cheated or was abusive in anyway. These people are not worth keeping around and your time will be better used finding new people that will make you happier. When you and your ex-beau decide itâ€™s time to try to be friends, donâ€™t jump in right where you left off. Take things slow by only seeing each other occasionally to ease your way into this new friendship. Donâ€™t get too personal right away because this is where it can get tricky. When youâ€™re friends with an ex it can be very easy to fall into the â€˜friends with benefitsâ€™ category, which is not a healthy situation for most people. By establishing normal friendship boundaries, you will be able to keep your ex-beau in your life while still being emotionally ready for romance with a new guy. When youâ€™re ready to just be friends with an ex-boyfriend, keep a close watch on your emotions as to not let the relationship drag on in its half-life. That way you can truly enjoy each others company in a friendly way and not suffer any emotional damage.